Lenovo has got plenty to show off at CES, with the manufacturer unleashing a pile of Legion-branded hardware including new Legion laptops alongside monitors and various gaming accessories. 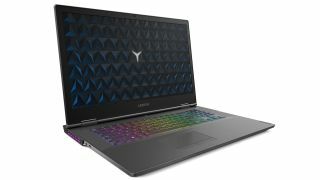 The gaming notebooks are the hottest properties here, with Lenovo introducing new Legion Y740 and Y540 models (which are a step on from the Y730 and Y530 machines we saw last year). The Y740 comes in 17-inch and 15-inch flavors and runs with 8th-gen Intel processors – either the Core i5-8300H or Core i7-8750H – just the same as the outgoing models. However, Lenovo is promising ‘cutting-edge’ GeForce GPUs on both sizes of the Y740, although the firm hasn’t qualified exactly which graphics solutions will be used. Presumably they will be Turing, of course, given that those are the latest GPUs in Nvidia’s range (the Y730 went with an Nvidia GTX 1050 Ti for the base 15-inch model). These refreshed machines will be equipped with a minimum of 8GB system RAM (2666MHz), allowing for specifying up to 32GB, with storage being delivered in the form of (up to) a 512GB PCIe SSD, along with (up to) a 512GB SATA solid-state drive, and a 2TB hard disk. Note that the 17-inch model is Optane-ready. You can go with the same Full HD display with a 144Hz refresh rate and Nvidia’s G-Sync, again as seen on the predecessor notebooks, but there’s also an optional Dolby Vision HDR 400 screen with a much improved brightness of 500 nits (as opposed to 300 nits) which is obviously beneficial when displaying HDR content. Other goodies include a better cooling system, an improved aluminum display hinge which gives more stability to the screen, and an upgraded battery to give up to six hours of longevity, Lenovo claims. The revamped 15-inch and 17-inch Legion Y740 laptops will be out in February starting at $1,749.99 (around £1,370, AU$2,450) and $1,979.99 (around £1,550, AU$2,775) respectively. As for the Legion Y540, that remains the more affordable model, and benefits from many of the same enhancements as the Y740, including that better battery life (at up to six hours), redesigned aluminum display hinge, and the optional Dolby Vision HDR display with a brightness of 500 nits (the default screen is the same as the Y740 at 300 nits with a 144Hz refresh rate and G-Sync). The Y540 will run with as yet unannounced Intel Core processors and one of the latest GeForce GPUs, plus it can also be specified with up to 32GB of system memory. Again, storage options are the same as with the Y740: 512GB PCIe SSD, 512GB SATA SSD, and a 2TB hard disk. The Legion Y540 won’t be available until later in the year – May to be precise – and will start at $929.99 (around £730, AU$1,300). Lenovo also revealed Legion Y27gq and Y44w monitors, the latter being a monster ultra-wide 43.4-inch display with a resolution of 3,840 x 1,200 and a peak brightness of 450 nits. The Y44w boasts a refresh rate of 144Hz (with a 4ms response time) and has FreeSync 2 tech on board to help prevent stuttering and tearing. If you don’t want a giant display squatting on your desktop, then perhaps the 27-inch Legion Y27gq will be of more interest, particularly with a storming refresh rate of 240Hz and a claimed response time of 0.5ms. This near-bezel-less monitor has a 2,560 x 1,440 resolution and Nvidia’s G-Sync technology on anti-tearing duties. Both monitors will be on the shelves come April 2019, with the Legion Y44w retailing at $1199.99 (around £940, AU$1,680) and the Legion Y27gq costing $999.99 (around £780, AU$1,400). And on the gaming accessory front, Lenovo introduced the new Legion M500 RGB Gaming Mouse which sports ergonomic textured grips, a sensitivity of 16,000 DPI and Omron micro-switches. Expect the mouse to arrive in April with an asking price of $59.99 (around £47, AU$84). Then there’s the Legion K500 RGB Mechanical Keyboard which benefits from a minimalist design, and keys with red switches for a quick response time, plus anti-ghosting technology. The K500 will also be out in April costing $99.99 (around £78, AU$140). Lenovo further revealed a pair of gaming headsets in the form of the Legion H300 and H700, which offer stereo and 7.1 surround sound respectively. Both headsets have retractable boom mics, and again, these will go on sale in April retailing at $59.99 (around £47, AU$84) and $99.99 (around £78, AU$140) respectively.